Improved Finishing - the tissue paper doesn't stick at the ends and it's easier to pull apart. 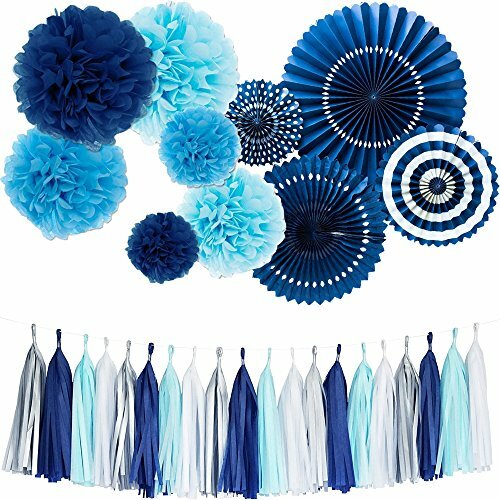 One garland includes: 20 tassels, (Navy,Blue,Light Blue,Light Grey). Each tassel is about 12" long after assembled. And each garland comes with a 10ft long FREE String for hanging these tassels. There is no stress when it comes to Monkey Home Basics pre-folded party fans. Sets of fans in basic colors to stand on their own or coordinate with your event's color scheme. Easy to assemble and reuse, they are the perfect fun touch for all occasions. The quick and easy DIY way to decorate your home or use for parties and events. Each pom pom: Individually flat packed with white ribbon pre-attached for hanging. Easy to assemble: Detailed instructions (in English) included and save your time. Perfect for any occasion: Birthday, Wedding, Christening Baby Shower, Kitchen tea party, Nursery decorations or any other celebration. 20 tassels per package (Navy,Blue,Light Blue,Light Grey) providing you with the best value. Each tassel is 12 inches long top to bottom. 6 Pieces pom poms(14inch:Navy Light Blue.10inch：Blue Light Blue,6inch:Navy Blue) .Each pom comes with one yard thin white ribbon for hanging. Ships flat, hanging string attached. 4 navy color fans: a 17" paper fan, a 14" tissue fan, an 11" paper fan & an 8" paper fan in a Navy Color - Solids or Stripes; Each fan includes paperclip and a loop to hang. If you have any questions about this product by Monkey Home, contact us by completing and submitting the form below. If you are looking for a specif part number, please include it with your message.